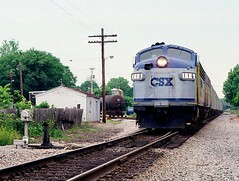 CSX #116 leading the northbound Roadrailer train at Falmouth, KY. June 1988. While we were waiting for this train to arrive, we noticed some guys working on the tank car on the siding in the background. Dome open, liquid on the ground. Nothing unusual about that, but the car is in a fuel storage facility, and the guys were smoking! . If we hadn't been so intent of getting a shot of this train, we would have moved on! Scan from 35mm slide.